Usually when I read my old reviews, I cower at how wordy and weirdly structured and tenuously argued they are. We all know what it's like to hear your own voice leaving a message. Horror show. But my piece from 2000 on You Can Count on Me actually sits well with me. Maybe I over-stressed Anne McCabe's role in achieving the film's remarkable precision, economy, and rhythm, at the expense of heralding these same qualities in Lonergan's script. The screenplay was already the movie's most feted aspect, and I clearly wanted to shine a light in other directions. Something about You Can Count on Me makes you want to champion an unsung hero. Still, it's a comfort to re-read most of this review, which is all the more gratifying because the movie itself is so nice to go home to. Plenty changes in life, but not this film, or what I admire about it. You can, as it were, count on it. Terry Prescott (Mark Ruffalo), who's incensed and depressed that his hometown never alters, that old habits always resurface, that people understand or misunderstand him in the same ways, decade after decade, might groan at what I just wrote. Sammy Prescott (Laura Linney), sunnier than Terry but no ingénue, less cabin-fevered and contentious than her brother but willful and complex in her own ways, might respond better. She likes when things continue, and dislikes gratuitous revision, like the all-new and ill-advised policies at her office. Then again, her behaviors inevitably upset the status quo, too. You Can Count on Me pays equal, compassionate, but ultimately unsentimental tribute to Sammy's relative equanimity and to Terry's unappeasable restlessness, without shaving either character down into a schematic foil for the other. The film itself is equanimous and restless, inhabiting a style that seems familiar to the point of conservatism, but using its understated style and selective attention to dig deeper than most projects gomaybe even deeper than this one advertisesinto community, singleness, loneliness, fecklessness, parenthood, childhood, and especially into something that has no good word in English: siblinghood. Particularly in this class and social milieu, and maybe altogether, has any movie ever done better by siblinghood? I first saw You Can Count on Me while passing through New York City, on the way to go visit my partner Derek, who was living in France for a year while we were in graduate school, so the reunion aspect of the film resonated. Months later, when it arrived in Ithaca, I saw it two more times in two different theaters, delighted to behold such a pitch-perfect encapsulation of upstate New York in upstate New York. You Can Count on Me is so stitched to that place and time in my life that to see it now is to fold effortlessly into its own themes of formative pasts and much-missed partners. To think about the movie is to think Kim, Ann, Shirleen, Sarah, Dorian, Anna, my graduate school siblings, now scattered far and wide, though none, as far as I know, jailed in Alaska. It's to think about Derek, whose siblings are everything to him, and about other relatives and friends who feel the same way, which doesn't mean they always see eye to eye. Clearly, circumstances were pretty well-aligned for me to dig this film, but in truth, my response surprised me. The lead performances respectively embodied my two favorite forms of in-theater discovery: "I never saw this coming from her" and "Who the heck is that?" I hadn't thought much of Linney in earlier roles. For my tastes, she didn't do enough in, say, Primal Fear to own her part or her scenes. In projects that made self-conscious use of her archetypal apple-cheekedness (Tales of the City, The Truman Show), the logic of her casting felt clearer to me than any creative impression she made. Ruffalo I'd never heard of; somehow his fly-by as Ryan Phillippe's quickly-abandoned bestie in 54 didn't linger. But two hours of You Can Count on Me turned me onto him and around on her, and there's been no looking back. Love them. Love. The way Linney says "Thank you" after the plumbing mishap and "You're an idiot" on the porch, and everything happening to her face, voice, and body at that bus stop. The way Ruffalo presents Terry as both a principled adult and a petulant child, sometimes wigging himself out, and the way he wrestles with such loopy, self-exonerating syntax as "I got into a fight down in Florida which I was not the one who instigated it at all." The honesty they coax from each other, in quiet moments and loud. That the same film features a peerless child performance from Rory Culkin and a gallery of unobtrusive but piquant background players (J. Smith-Cameron at the bank, Adam LeFevre as the watchful sheriff, Lonergan himself as rumpled but discerning Father Ron) earns it an alcove of its own in the acting Hall of Fame. The hits keep coming off camera. Melissa Toth knows just what the prettiest budget-conscious single mom in town would wear (basically, the Talbot's sale rack, but still flattering) and the locations feel spot-on. I'll violate Lonergan's refusal to belabor points by calling the movie one where everyone can clearly count on everyone else, in big jobs and small. There's such a warmth to it, even when characters are angering and disappointing each other. You imagine even the crafts services folks thinking, "This is a really good one. I'll see this one when it opens. I'll take Mom. I'll take my sister." Maybe I don't love the score, but hey, the movie also teaches us to make peace with imperfection, or to try. You don't hear as much today about You Can Count on Me, even compared to movies of the same vintage and with overlapping fanbases that either never clicked for me (Almost Famous) or hold up slightly less well (Wonder Boys). 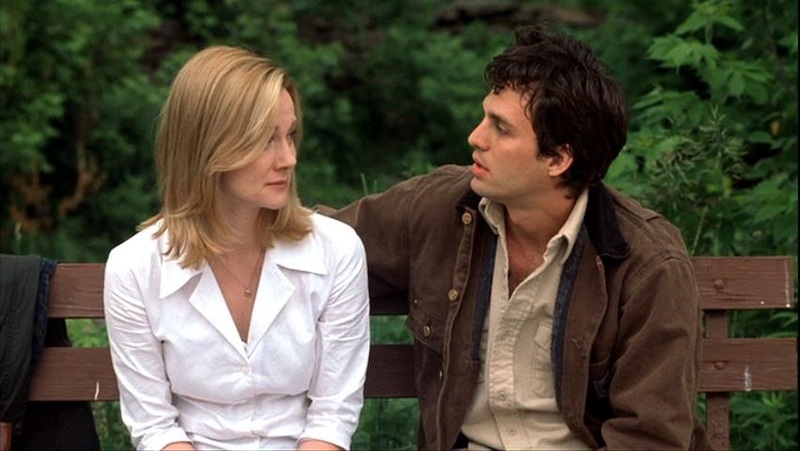 Linney and Ruffalo have been such rewarding, ensconced presences on our stages and screens ever since that it may be hard to recall they were ever anywhere but the pantheon, and that they made such a splash in a film so scrupulously marshaled against splashiness. Critics really made the difference on this one, insisting on the value of a project that could easily look generic or smell a little maudlin. They rode even more elaborately to the rescue (though not as quickly as some like to recall) for Lonergan's notoriously postponed follow-up Margaret, a doozy of both excessive emotion and inchoate feeling, somehow at the same time. I wonder if the furor over Margaret's burial and resurrection has overshadowed its older sibling, which incidentally was filmed in Margaretville, New York. You Can Count on Me has less sweep and takes fewer obvious risks in pitch and structure, but to achieve what You Can Count on Me achieves is itself ambitious, and much harder than it looks. Maybe that's why I sometimes think about Sammy and Terry in allegorical terms as the critic and the artist. There's no textual prompt to do this, and probably good reasons not to, and I'm agnostic about who gets cast in which role. It's a willful analogy, but You Can Count on Me teaches us that soft-focus projections onto people or things we care about can be very soothing, as long as we don't depend on them too much or lock our intimates into roles we've dreamed up for them. So, with those caveats in place: critics and artists, possessed of similar loves, prone to comparable insecurities and vulnerabilities, but tending to approach them differently and to pick weird fights with each other, can often drift apart, learning to live without each other's company or approval. That's probably good. But sometimes they sit on the same bench, suffused with similar feeling, each speaking a language the other hears perfectly, even if tomorrow they once again find themselves at odds. "Critical darling" often connotes something rarefied and forbidding, but sometimes it designates a gloriously accessible gem that might otherwise have idled among similar-looking cohorts, had some special wavelength of understanding not opened with its first round of viewers. Critics' power is not what it once was, but they can and do still use it for occasional, memorable good. Often they're stultified by so much hidebound or interchangeable product, until some real artists come along to shake up their assumptions, or to revive their capacities for love, or both. The siblinghood of Terry and Sammy, who need each other even when they censure or repudiate each other, who prop each other up at times when it's most needed, and as nobody else could, feels something like this to me. But the siblinghood of Terry and Sammy also feels "like" nothing and nobody else. At the end of the day, it's the specificity of You Can Count on Me, not its portability into any larger frame, that makes it precious to me. If there are any two characters in film whom it's tempting to misremember as people I actually met once, it's these two, created and preserved forever through Lonergan's wise, sad, funny pointillism. Hey, Reader: What movie dazzles you most with its grasp of siblinghood? Don't say The Savages, which is a perfect choice, but obvious in context. Say something else.